Don't worry, the focus of this blog remains intact. We just thought we'd post a couple of cyclists of the male variety to highlight a bit of dapperliciousness. This chap, above, is a poster child for individual style. Just the fact that he's riding one of the retro 10-speeds, with the curvy handlebars of my distant youth, is retro coolaliciousness. 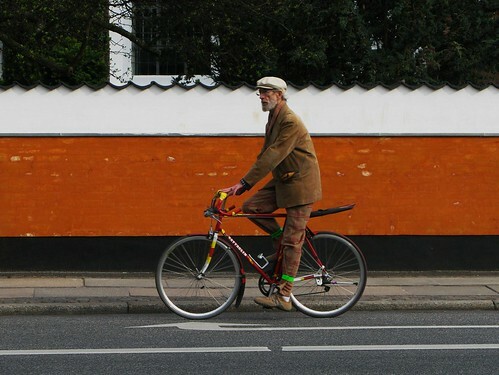 Then there's his clothes, cap and the coloured tape on the bike. What a sight. 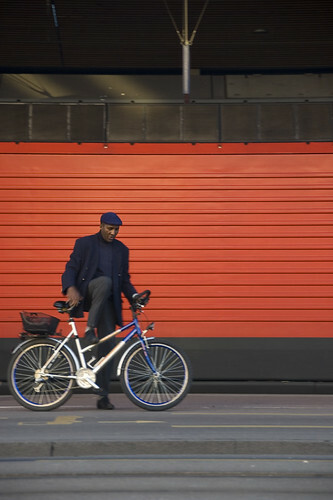 And from outside the Hauptbahnhof in Zurich, ubiquity_zh on flickr snapped this dapper gentleman getting ready for the lovely bike lanes of Zurich.